Our guild sponsored a workshop last Saturday. The workshop was called, “This Quilt Has Handles” and the instructor was Carola from Carola’s Quilt Shop in Gibsons, BC. 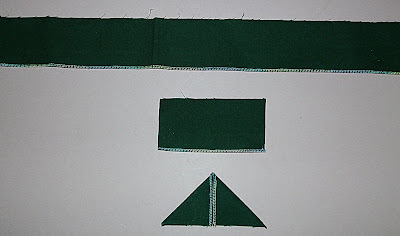 The workshop was not so much about the article that we were going to make – a purse – but about quilting and embellishment techniques that we could use on other projects. These are pictures of my 2 quilts so far–one quilt for the front of the bag and the second quilt for the back of the bag. My quilts are still minus the handles and the finishing part, that is why they are still two flat pieces. 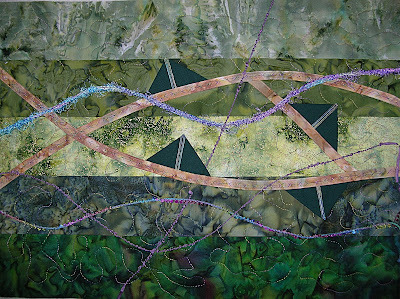 You can see the techniques we worked on–free motion quilting, prairie points, bias strips, decorative stitching, yarn couching, and bobbin work. I did not get to practice putting beads on by machine during class, but I will take the time to practice that technique before doing the final steps to assemble my bag. 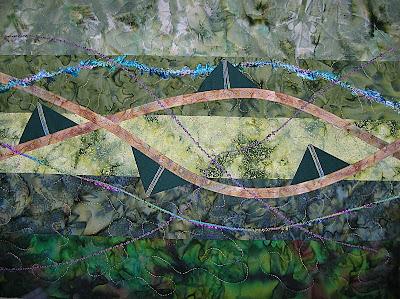 This technique allows you to make prairie points that end up being only two thicknesses of fabric–more suitable for adding to embellished garments or quilts rather than the traditional prairie points made from four thicknesses of fabric. This entry was posted in bag, embellishments, workshop by Norma Hanson. Bookmark the permalink. Now I get it about the prairie points that you and Pam were talking about. I can see where you would want them flatter for this project. Looking good so far, Norma. You must have had a blast learning these techniques at the workshop!